Security conscious types with a hankering to pepper their homes with sensor-packed cameras to keep remote tabs on their stuff should point their eyes at Blink: a wireless connected security camera with a relatively cheap price-tag vs the extant competition. Blink is currently a prototype — with its makers pulling in crowdfunds via Kickstarter to go into production, aiming to ship in May next year. At the time of writing the campaign is just over half way to its target of $200,000, with another 41 days left to run. So it’s looking like it has a decent chance of getting funded. In the home security camera space there are a fair few options to choose from already — such as the likes of Dropcam — recently bought by Nest (itself owned by Google) for $555 million. With that level of cash and interest floating around, others pushing into the connected camera space is inevitable. How is Blink different? It takes the camera component wireless — promising battery life of more than a year (with “standard use”; defined as 4,000 five-second events per year, or 20,000 total seconds of video recording) — so you have more freedom about where you site your all-seeing motion-triggered eyes, since they don’t need to be tethered to a mains plug. A secondary Sync Module device does need to be plugged in for the system to work though, and that’s presumably where the Wi-Fi radio lives, with the Blink camera (or cameras) connecting to the module via Bluetooth to keep power consumption down. Update: Blink’s makers have confirmed there is, in fact, Wi-Fi in the camera, and that no video goes through the sync modules. Instead, they say they have developed a system enabling the cameras to remain on “ultra low power” and be woken up by the module on demand to preserve battery life. 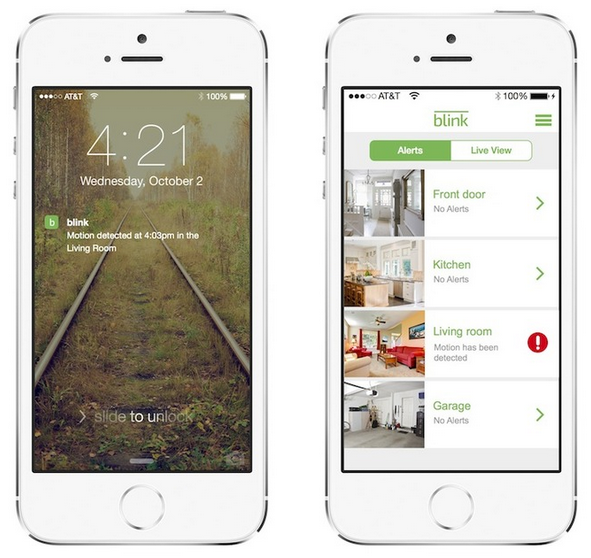 Currently the device does not have a local storage option, so recorded footage is always uploaded to Blink’s cloud for viewing later — or users can peek at a live feed of the inside of their home whenever they fancy via the companion app. However Blink’s makers say they may add a local storage option as a Kickstarter stretch goal — i.e. if they manage to crowdsourced substantially over and above their $200k target. But, even without a local storage option, it’s worth noting that Blink’s cloud storage is feeless — so there’s no requirement to pay a monthly subscription to access video recorded by your own cameras. Which does put some more clear water between Blink and other systems. Dropcam, for instance, charges $9.95 per month for 7 days worth of saved video, or $29.95 for 30 days’ worth. The Blink camera records at 720p HD, and also includes a temperature sensor, microphone, night vision and the aforementioned motion sensor so it can trigger if someone or something moves around your home when you’re not there. IThere’s also an LED built onto the camera — and an option recording alert noise — to make whoever is in the room aware that they are being watched. So a little less creepy spy tech. When Blink has been armed, alerts triggered by motion are sent to the corresponding app so the user can react and check up on what’s going on by looking at the Live View of their cameras. Footage of alert events is also recorded and saved to the cloud so you can check it out later. So how much does Blink cost? Early Kickstarter backers were able to bag a unit for $49. It’s now stepped up to $59, with a $69 mainline price after all discount pledges are bagged. Even at $69 it’s considerably cheaper than the likes of Dropcam — even on the upfront hardware cost alone, without factoring in the recurring monthly fees bill. So, if Blink can pull off what they claim, they’re going to be undercutting the more established competition by a fairly wide margin — giving them a shot at bagging buyers who have, up to now, been put off by the cost of turning their home into a digitally enabled panopticon.